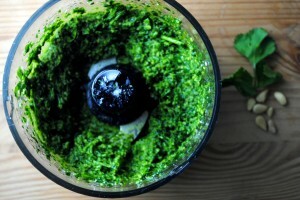 I first tasted cilantro pesto a few years back at August restaurant in New York. It came spread on toasted baguette as an accompaniment to a shared starter of steamed mussels; it was a revelation. I have been craving and making it religiously since then. I toss it with pasta, spread it on bread, serve it with eggs, use it with crostini, and more. It’s really very versatile. But still, my strongest association with it is with mussels, and every time I make them I must have toasted baguette with cilantro pesto on the side. If you have that terrible hereditary thing where cilantro tastes like soap, then, well, I’m sorry for you. Everyone else, you’ll love this. 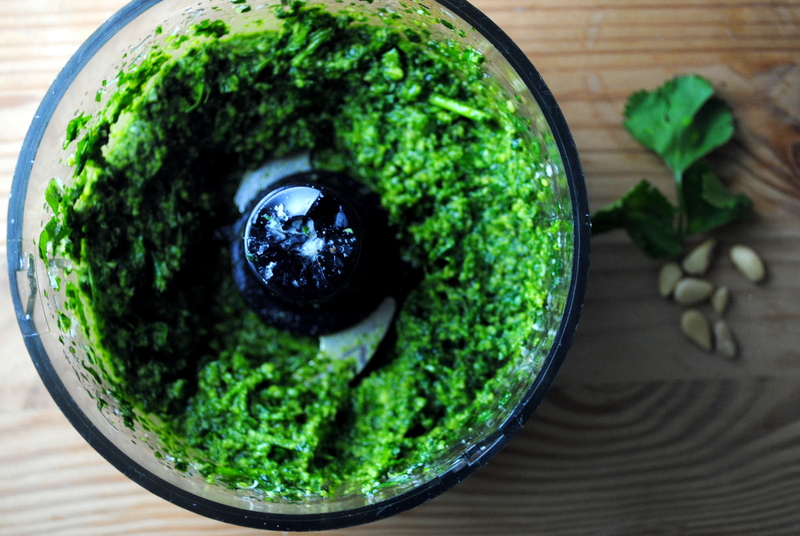 Put the cilantro in a food processor and pulse until chopped. Add the garlic and pine nuts and pulse to combine. Add about half the olive oil and blend until a paste begins to form. Add remaining olive oil and Parmesan cheese. Taste, season with salt and pepper, and add pine nuts, garlic, parmesan, salt or pepper as needed. Toss with pasta or serve on toasted bread. 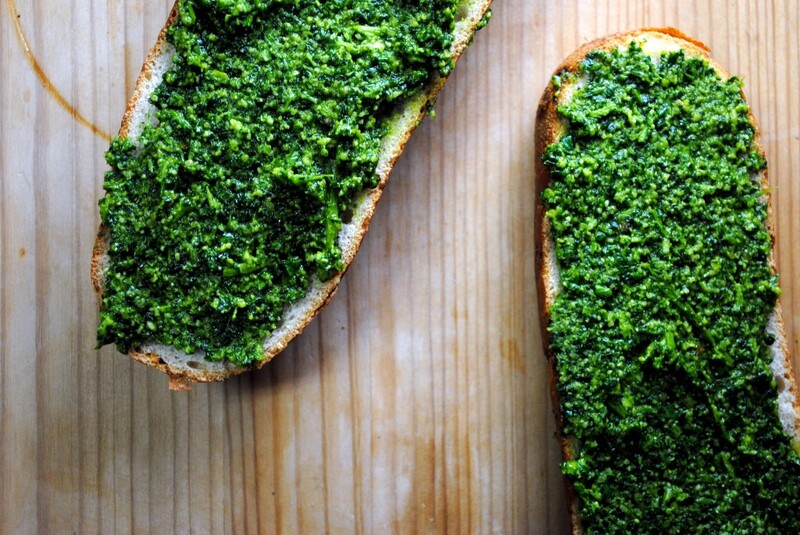 I’ve always been a huge fan of cilantro pesto! (or anything cilantro for that matter…) Have you ever been to Pio Pio in NYC? They make a spicy green sauce that is cilantro and jalepeno based that is amazing. I believe it’s a Peruvian sauce called Aji. Ooh I’ve never been to Pio Pio, but that sauce sounds amazing! I will have to go there when I’m next home.